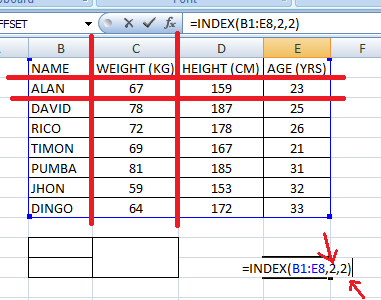 INDEX function returns a value or reference of the cell at the intersection of a particular row and column, in a given range. Syntax of this function is INDEX(array, row_num, [column_num]) where array is required, If array contains only one row or one column then put the value only for row_num or column_num. If the array has both more than one row and column then it is necessary to put both the values of row_num or column_num to get proper result. Here I have shown an example where formula =INDEX(B1:E8, 2,2) is put to find out the value at intersection of row no 2 and column no 2 of B1:E8 array. and the result is 67. shown in picture. MATCH function returns the position of an item in an array that matches a specified value in a specified order. Syntax of this function is =MATCH (lookup_value, lookup_array, [match_type]) where lookup_value is The value to match in lookup_array, lookup_array is the array from where you have to lookup the value, [match_type] is optional How to match, specified as -1, 0, or 1. Default is 1. 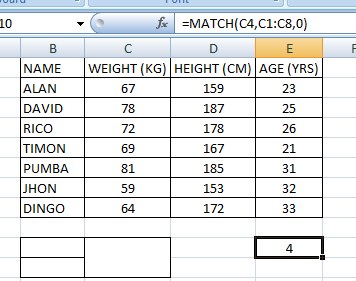 Here I have put the formula =MATCH(C4, B4:E4,0) where it will show column number for the value within the array. 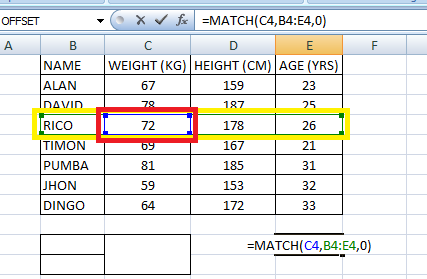 Another example of finding out the row number where I have put the formula =MATCH(C4, C1:C8,0) where it will show row number for the value within the array. Combination of these two functions can easily replace any lookup function. 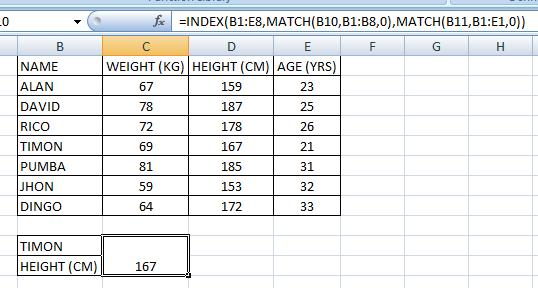 The MATCH formula within the INDEX will search the row_num or column_num and INDEX will find out the value like it has shown in the picture. Try this and this is better than any lookup function.